Wednesday was a big day for my fund. Earnings season is upon us and two of our largest longs reported quarterly results. I expected both companies to smash analysts’ estimates. Sure enough, that’s exactly what happened. You’d think I’d be celebrating big gains in both stocks, but unfortunately, you’d only be half right. Too bad this isn’t baseball. Batting .500 will get you into the Hall of Fame in that sport. In my game, though, it generally won’t get you too far. This entry was posted in investing and tagged energy industry, for-profit education, Grand Canyon University, Ira Sohn Conference, oil prices, Trinity Industries on October 31, 2014 by scott fearon. When I seek new investments for my $100 million fund, I often research companies that benefit from secular changes, large shifts in society and business. Three epic secular shifts happening right now are: the rapid adoption of cloud computing platforms, the tidal wave of growth in Texas (almost a million people a year are moving to that state), and America’s booming energy renaissance. The last change is particularly breathtaking. We’re pulling up almost nine million barrels of oil a day now in this country. That’s almost double the amount we extracted ten years ago. Natural gas production is way up as well, causing some analysts to predict America will be a net exporter of fossil fuels sometime in the next decade. This growth in domestic oil and gas production is obviously good for energy companies. But how those fossil fuels get from the ground to the gas pump will strongly benefit one, very old-school mode of transportation: railroads. That’s why one of my favorite stocks these days is Trinity Industries’ (TRN). Its products were last considered “high tech” in the 19th century. But they’re going to make the company a ton of money here in the 21st. This entry was posted in investing, secular change and tagged Big Oil, energy industry, Keystone Pipeline, railroads, Trinity Industries on May 7, 2014 by scott fearon. "Anyone who has ever bought a stock or managed a business, big or small, will devour this book." "[A] surprisingly entertaining mix of business guide and memoir." "[Scott Fearon's] insights on the common ways that mature companies often doom themselves apply equally well to start-ups. Every business, young or old, needs to avoid the ... mistakes that he outlines." "If you want to read a sharp, insightful, bitingly funny, crystal-clear, quick-read book that could help you avoid making fatal mistakes with your business, pick up Dead Companies Walking." "So well written ... I finished Dead Companies Walking in two sittings." "Sharp insights into human fallibility as a potential source of moneymaking opportunity." 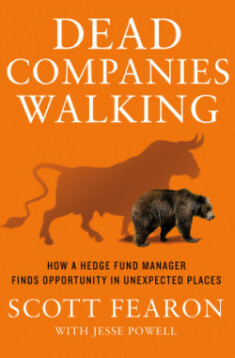 "With the upcoming publication of his debut book Dead Companies Walking, Scott Fearon ... is unlikely to remain one of the best hedge fund managers you've never heard about." Scott Fearon has spent thirty years in the financial services industry. 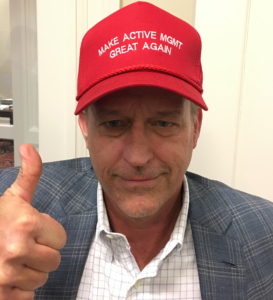 Since 1991, Scott has managed a hedge fund in Northern California that invests in fast-growing companies with little or no Wall Street coverage while shorting the stocks of distressed businesses on their way bankruptcy. will the trump rally cost us in the long run?